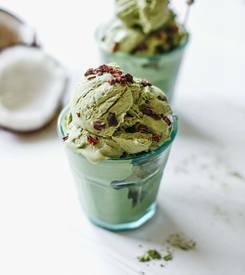 Green tea matcha coconut ice cream! This Green Tea/ Matcha Coconut Ice Cream is so fresh, tasting vividly of coconut with just a tiny hint of green tea. The recipe is so super easy. No ice cream maker is needed, just a simple blender, a large tub for storing, and of course….a freezer!